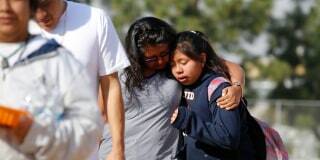 Like mass shootings in general, school shootings have gone from being a rare tragedy to a tragic reality. Already in 2018 there have been at least 17 instances of gun violence in U.S. schools, including the shooting Wednesday at a high school in Parkland, Florida. In one recent attack at a Kentucky middle school, two children were killed and 18 others were wounded when a fellow student opened gunfire. When I saw the news, I felt the all too familiar sinking in my gut, the clench of anxiety in my throat as thoughts of the victims and their families careened through my mind. I took a moment to do my version of praying for those affected and to ponder a question that has been on my mind since the Sandy Hook shooting in 2012: How can you possibly explain these shootings to your kids and how to do you talk about it? I put these questions to mental health experts who are also parents dealing with these concerns at home. Here are their best strategies to keep the lines of communication open and your own emotions in check. I focus on what we have control over. I don’t make promises I can’t keep.